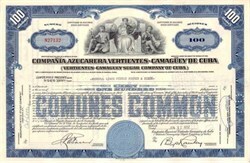 Pack of 100 Certificates - Camaguey Sugar Company of Cuba - Pre Revolution American Sugar Company - Havana, Cuba - Price includes shipping costs to U.S.
Home > Certificate Quantities for Educators / Business Promotions > Pack of 100 Certificates - Camaguey Sugar Company of Cuba - Pre Revolution American Sugar Company - Havana, Cuba - Price includes shipping costs to U.S. Beautifully engraved certificate from the Vertientes - Camaguey Sugar Company of Cuba issued from 1951 to 1962. This historic document was printed by the American Banknote Company and has an ornate border around it with a vignette of two allegorical men on both sides of a woman sitting on a throne. This item has the printed signatures of the company's officers and is over 54 years old. This is a famous sugar company that was nationalized when Castro took over in Cuba. The stock was still traded during the 1960's, after Castro nationalized the company, in hopes the shareholders would be repaid for their losses. The shareholders never recouped their losses. The Company owned mills and lands which supplied cane and they were located in the central part of the Province of Camaguery, Cuba. Lands aggregated approximately 900,000 acres and included the mills known as the Centrals Agramonte and Vertientes. All of the mills owned by the company were managed by the General Sugar Company. Capacity of the mills were 1,700,000 bags per annum. The company also owned the railroads of the Central Santo Tomas. The company had general offices in Havana, Cuba and their executive offices were located in New York at 67 Wall Street. Beginning in 1926, sugar entered into a crisis of over-production in the whole world and Cuba started restricting its sugar crops. The crisis, and the high tariff of two cents per pound for sugar in the United States (1930) brought about a vertical decline in the island's sugar production. In 1933 production reached only 1,994,238 Spanish long tons. Cuba did not produce a 5 million ton crop until 1947, and in 1952 a production of 7,011,637 tons was recorded. In 1959, Castro nationalized all US-owned companies and by establishing closer economic and political ties with the Soviet Union. Among the companies that were nationalized, was Compania Azucarera Vertientes-Camaguey de Cuba (C.A.V. ), a Cuban corporation whose stock was mostly owned by U.S. residents .Washington began an economic blockade and cut off diplomatic relations in January, 1961. The US effort to topple the revolutionary government culminated in the 17 April 1961 Bay of Pigs invasion by 1,400 CIA-trained Cuban exiles. The invasion failed miserably. The following October the Cuban Missile Crisis brought the world to the brink of nuclear war. Moscow had installed 40 nuclear missiles on Cuban soil. The US threatened war unless the missiles were removed: in the end the Soviets backed down in exchange for a promise from President Kennedy not to invade.